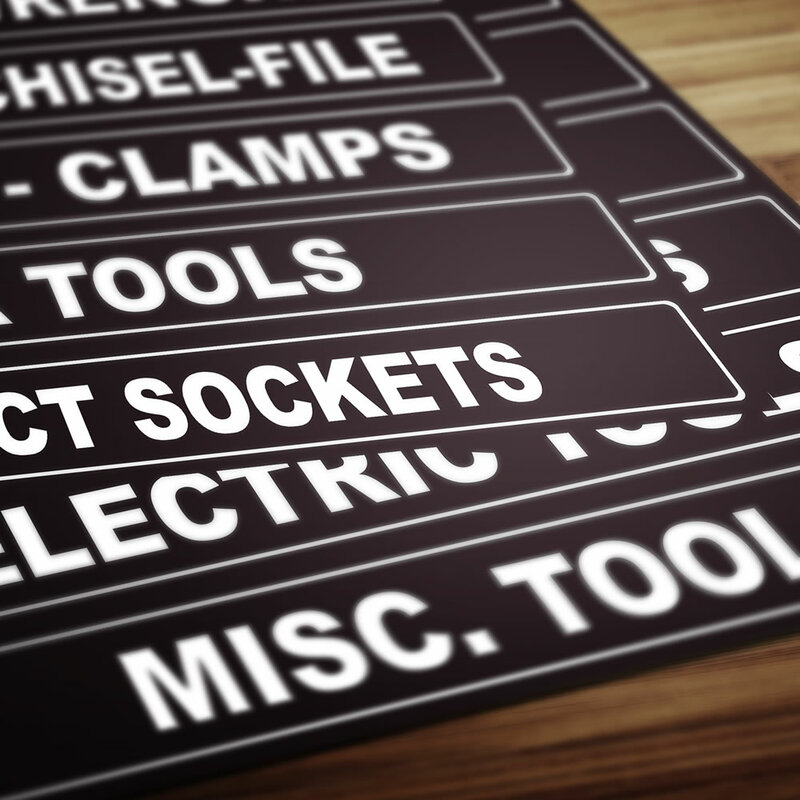 The magnets were shipped promptly and when treat arrived they are perfect for keeping my tools organized. I would recommend them for anyone wanting to know at a glance where a certain tool is located. These are great and I am really pleased that they have such a great finish and look. They are a great addition to my tool box. 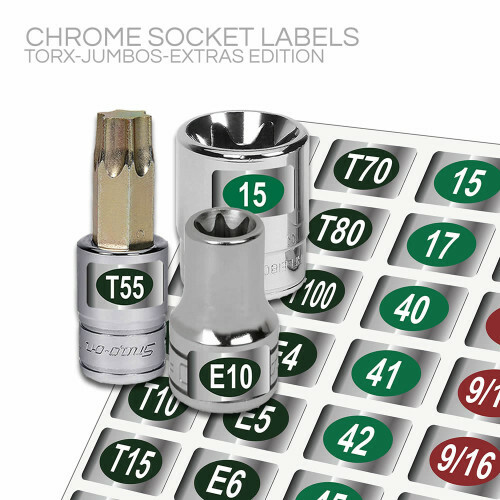 They were perfect for my new toolbox…now I don’t have to remember which drawer the screwdrivers or the sockets are in. 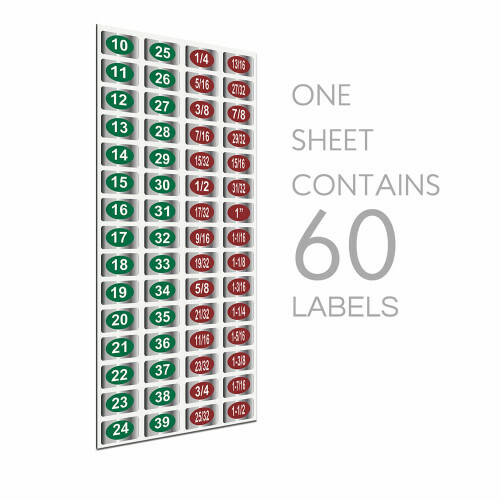 Works great and if you decide to re-arrange to another drawer, magnet label goes with it. 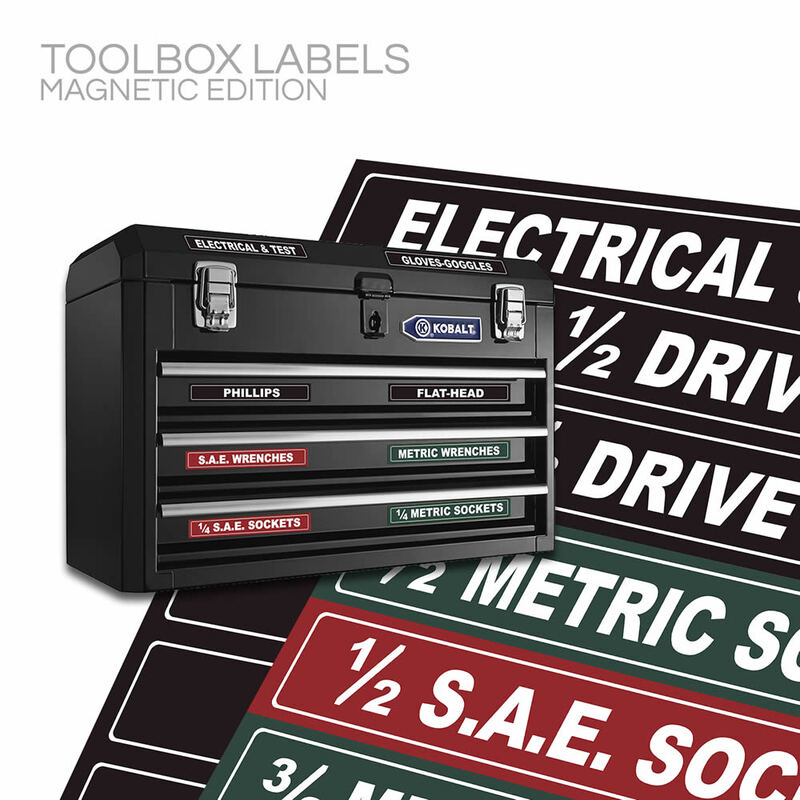 Great magnets for a mechanics tool box. Has most everything you could want to display on the outside so you don’t end up opening every drawer. works great when having someone else grab tools for you. 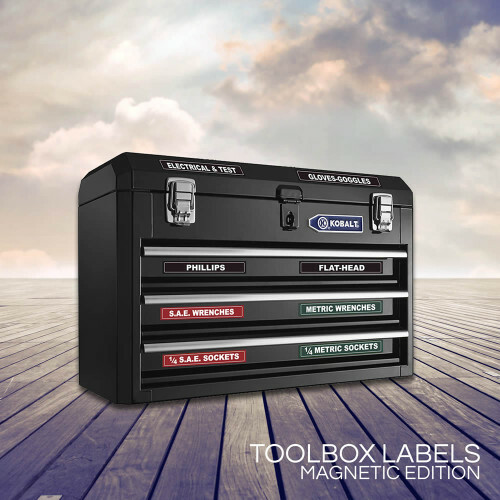 would like to get a second set for my other toolbox! Excellent product! 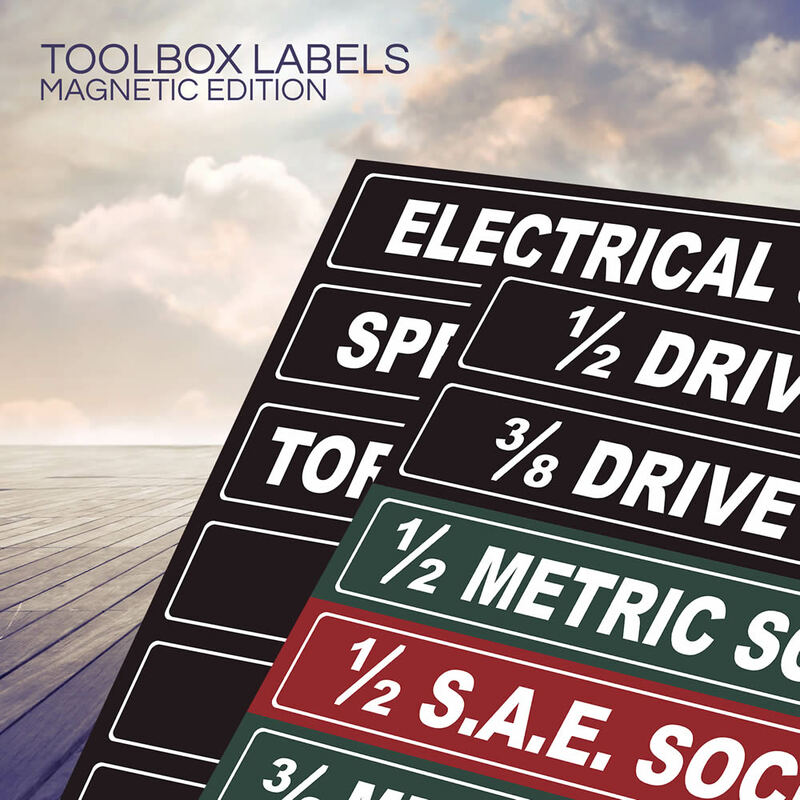 Having the labels on bottom shelf allow me to scan what’s in my toolbox without having to bend down and open doors randomly. 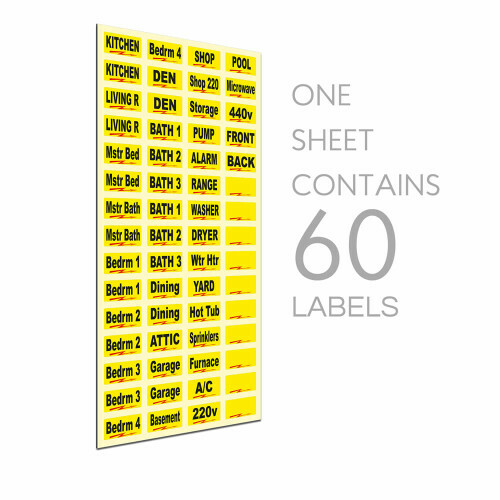 My husband really likes the neatness and the organization these magnetic labels are used for. Stop searching and start doing! 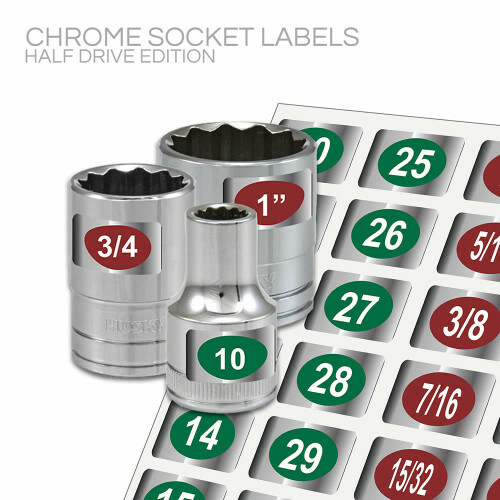 If your like me and have gradually accumulated more toolbox storage over time these will be a welcome addition to your garage. 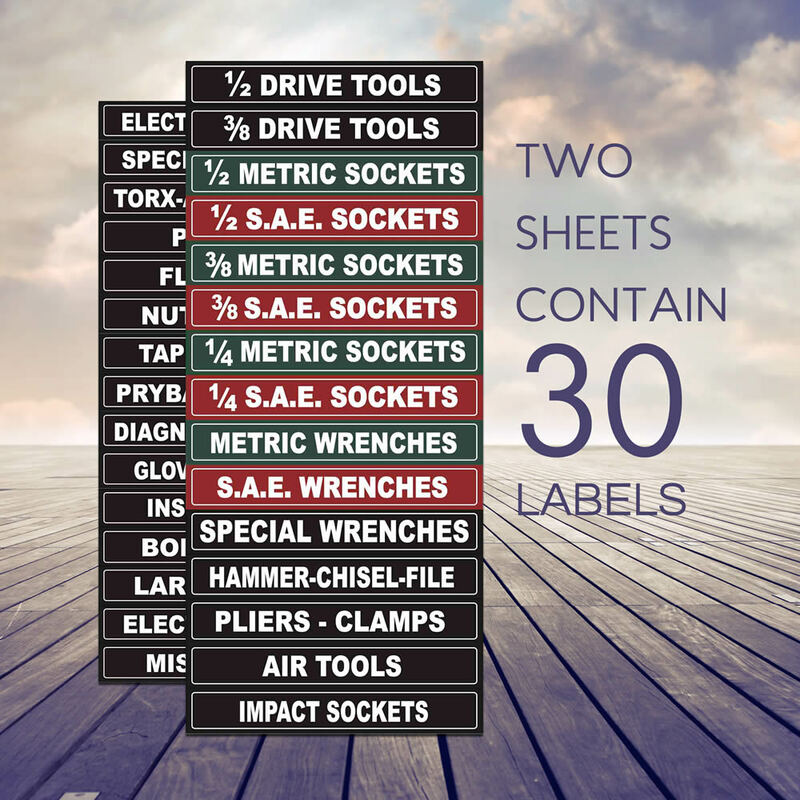 I spent hours organizing my tools in my toolboxes, but over time, it became difficult to recall exactly which drawer something was in. 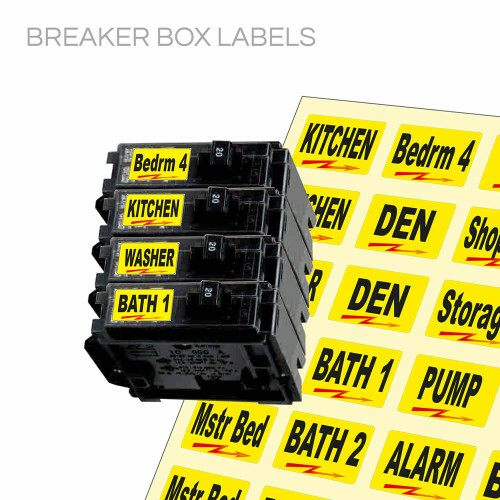 I had thought about buying a label-maker to do this but realized over time I may want to move items and sort them differently, particularly as I accumulate metric and other sets I need. That is where these really come in handy. 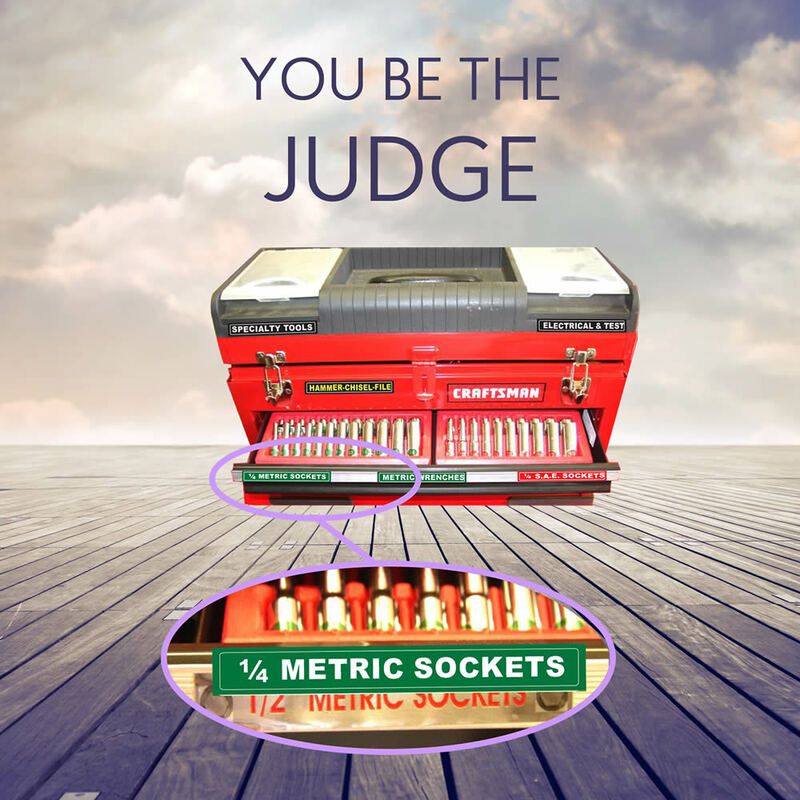 Gone are the days of searching for the metric sockets versus SAE. The different screwdrivers I used to store in one drawer just so I knew where to look but they were all so jumbled I had to dig around to find the right one. No more, not with these! 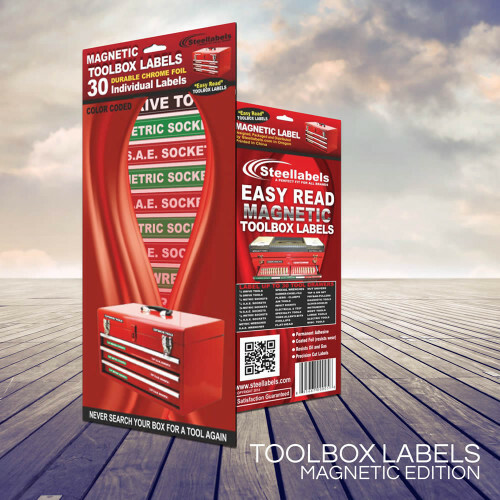 The only caveat I have for you is that if anyone else uses your tools, or is in the garage routinely, these are simply magnetic and can be moved without difficulty. This may not be the best option if you have someone who loves to move things around, like a child, as they are drawn to these things it seems. Short of that or the practical joker who resorts them, you will be pleased you bought these and they will make your time devoted to your projects much more enjoyable and you will spend more time doing than hunting. If your the type who just throws things haphazardly in a drawer, this will not help you much, if at all. It would be nice if there were more options or kits for special tools or sets than these standard ones but these cover most of what I use the most frequently. It would also be nice if instead of white characters on black they were black on white or had different options, as most of the tool chests I have are fire engine red and I would like them to stand out more, but they are functional. They are big enough that I can read them without reading glasses and incident light does not create a glare on them prohibiting reading them. These are so useful I have to wonder why this type of kit is not a standard inclusion in the tool chests to begin with. A time saver in every regard especially for the DIYer. We don’t memorize where our tools are like the professional, but I have even seen these on the professional mechanics toolbox plus it makes for easier organization. These were perfect for my husbands tool box, the magnet is strong. Awesome product. Works exactly as it was described. It is very useful to check the tool in drawer!!! 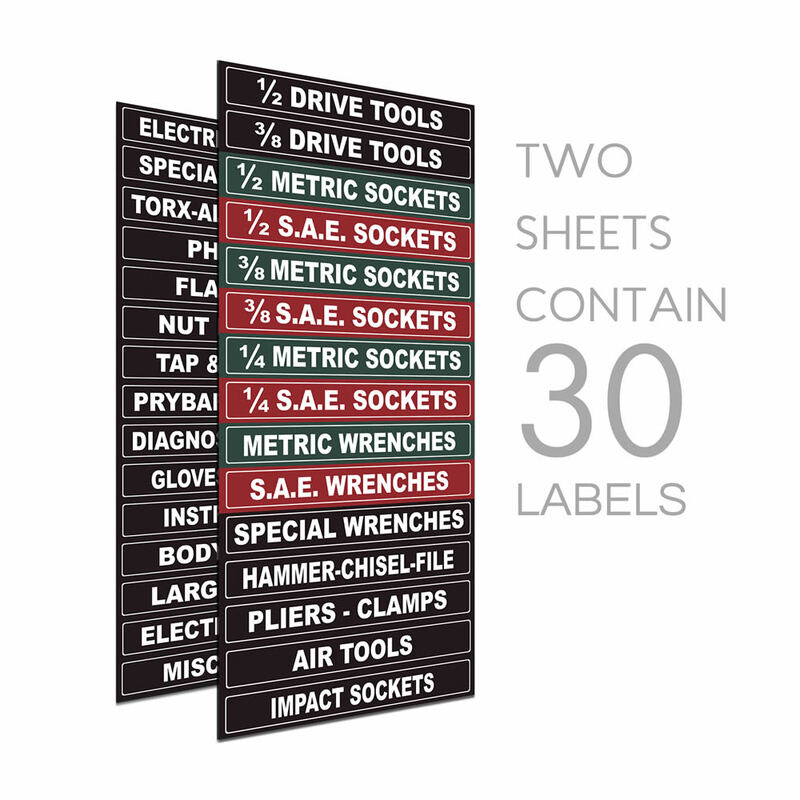 Great for organization and sending someone else to get my tools for me as they can now know where they are! This was the perfect stocking stuffer item for my husband for Christmas. He really likes these and they work great on his Craftsman tool chests! Perfect for my OCD husband. 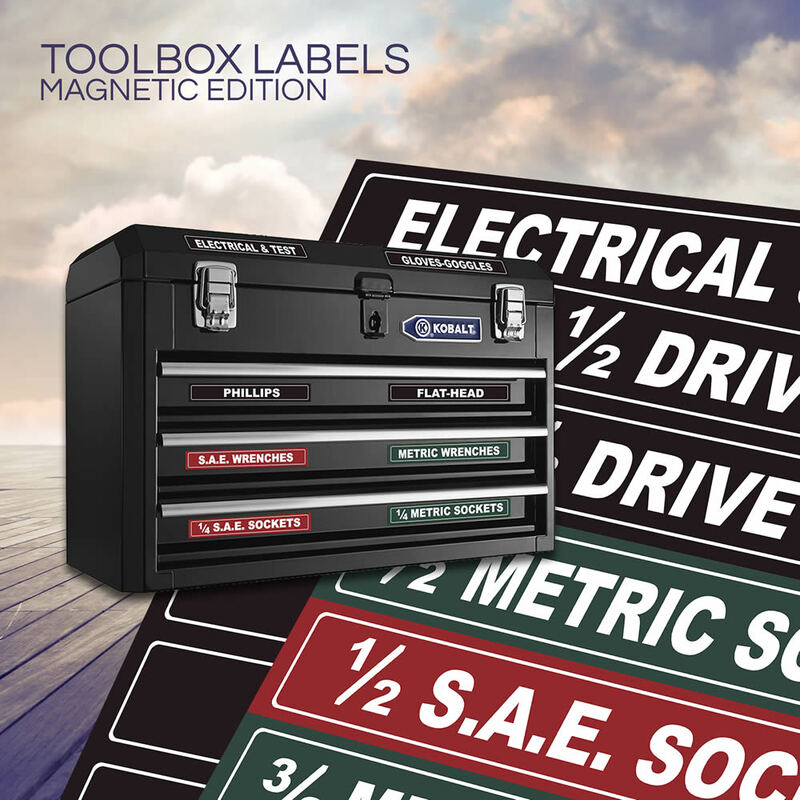 They are large enough to read and fit the toolbox well. They are also handy cause I can now easily find what tool I’m looking for, rather than opening every single drawer. 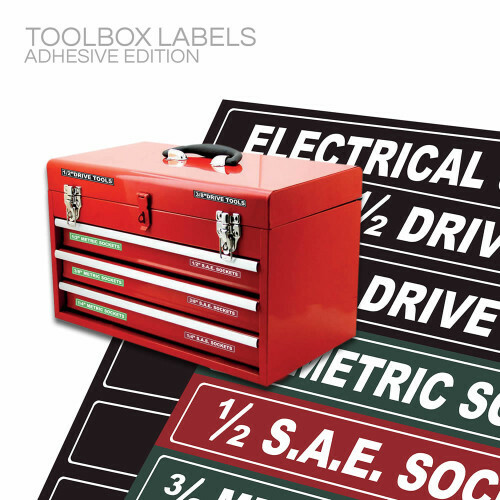 I did not use all the labels, but there were more than enough to get my tool box set up. 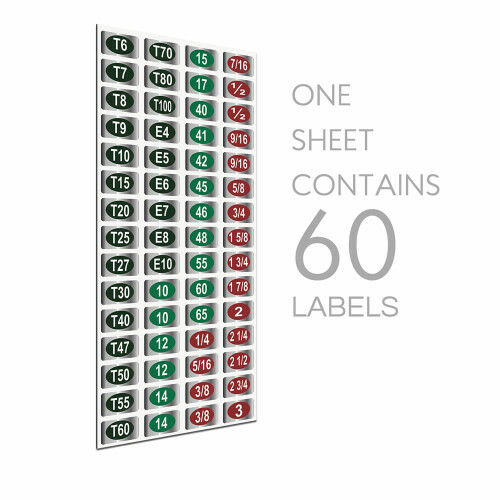 Easy to read and magnetic, so you can change your set-up and label your drawers as you like. Great addition, wifey likes it too, she doesn’t have to ‘search’ all the drawers, it’s finally organized to her liking! No more pulling each drawer open to find that seldom used tool.